Stuck in traffic this morning on 101 with thousands of my closest friends, I pass the big LED billboard in San Carlos and there it is. Unless you caught the show last night after Game of Thrones you probably would just think it was another billboard for some cloud based music sharing app or whatever else is normally on these billboards. Nope. Just good old fashioned Pied Piper viral marketing. Redditers have reported this billboard is up along 880 by Oracle Arena as well. Good stuff Mike Judge and crew. 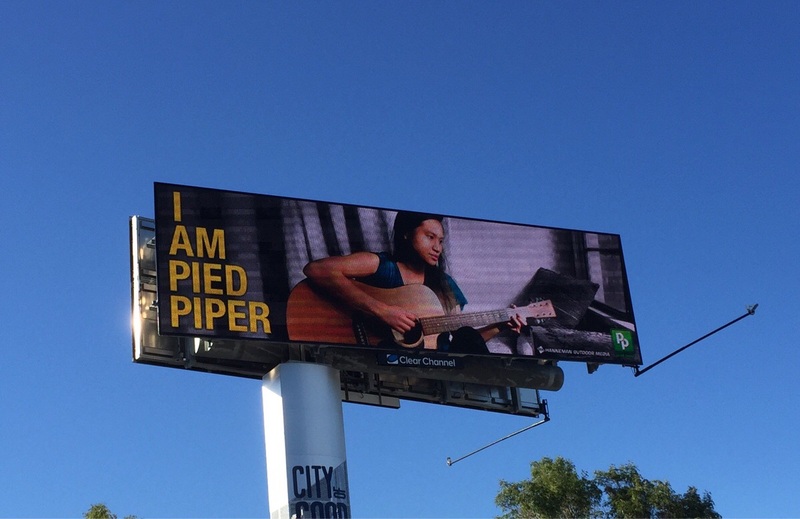 Here is the actual I AM PIED PIPER billboard that is scheduled to be up through May 3rd. And now that Pied Piper has Russ Hanneman funding, they are hiring. Are you a fiend for data compression? Do you fully understand the theory behind middle-out compression? Then Pied Piper may just be for you. But if you think middle-out compression is some kind of slimming garment that Erlich Bachman wears then maybe you should just watch the show. Wonder what HBO’s Silicon Valley will try next? Billboards with only the words: Who is Strychnine McTwat? I am Pied Pipermiddle-out compressionSilicon Valley HBOWho is Strychnine McTwat?